For the Weekend of Food 2017, every guest presided over a course, and my responsibility was the fish course (yes, it was a meal fancy enough to have a fish course). I was give a few weeks’ notice, and so I thought long and hard about what I should prepare. 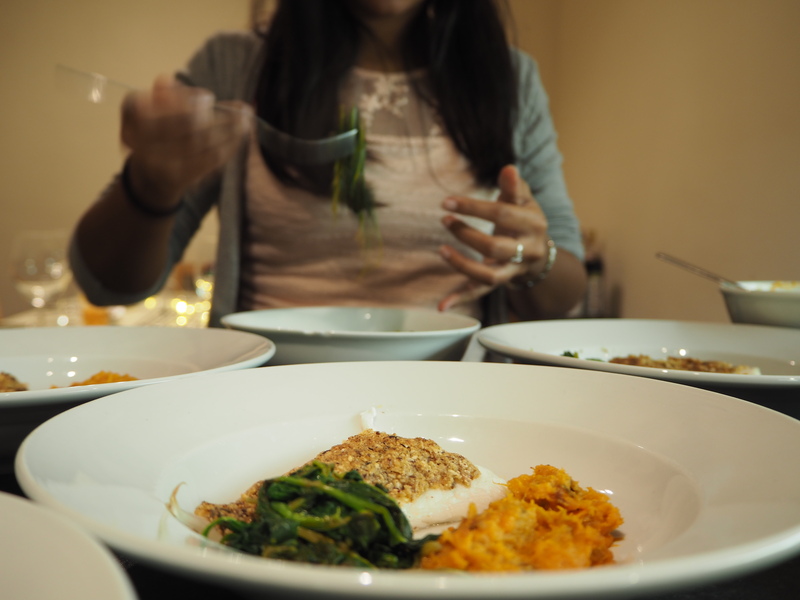 The theme was Scottish, but erring towards contemporary cuisine with Scottish ingredients, rather than haggis, neeps, and tatties. 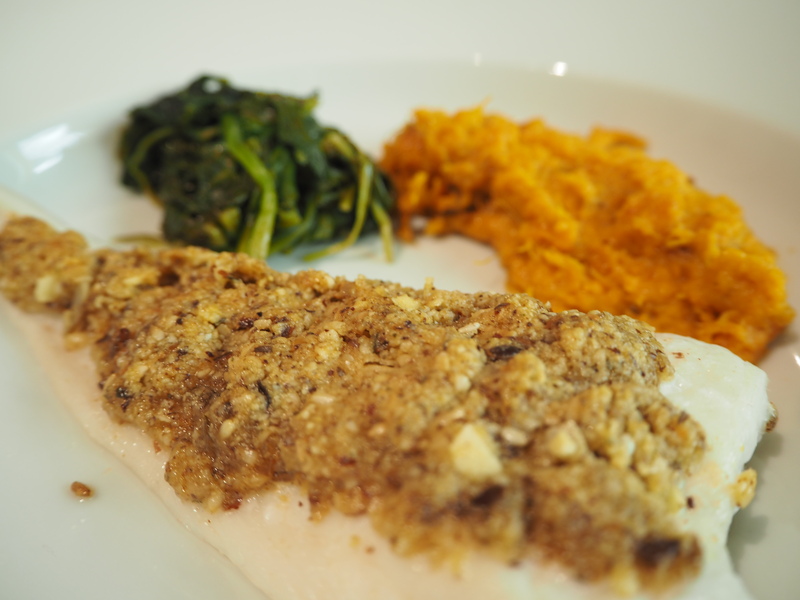 And so I looked up which fish reside in the Caledonian waters, decided against langoustines and salmon, and opted for a lovely fillet of haddock. But which flavours should I combine it with? I suddenly remembered a recent brunch at the Modern Pantry in Clerkenwell, where my Eggs Benedict had been perked up with a crunchy addition of dukkah (an Egyptian nutty concoction). 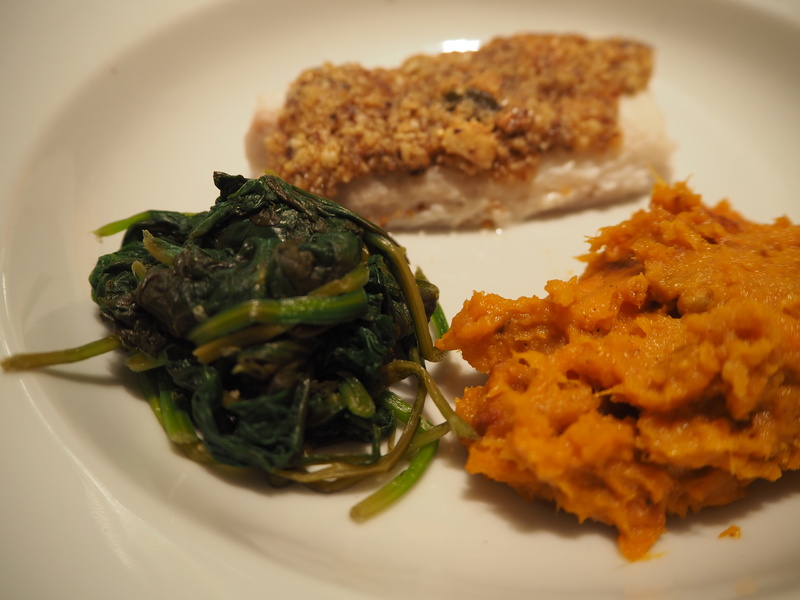 I then did a bit more research, and came up with a masterpiece (even if I do say so myself): Baked haddock with a dukkah crust, served with lemony spinach and roasted sweet potato mash. I am actually really proud of this dish, and was so happy that it went down well on the day. 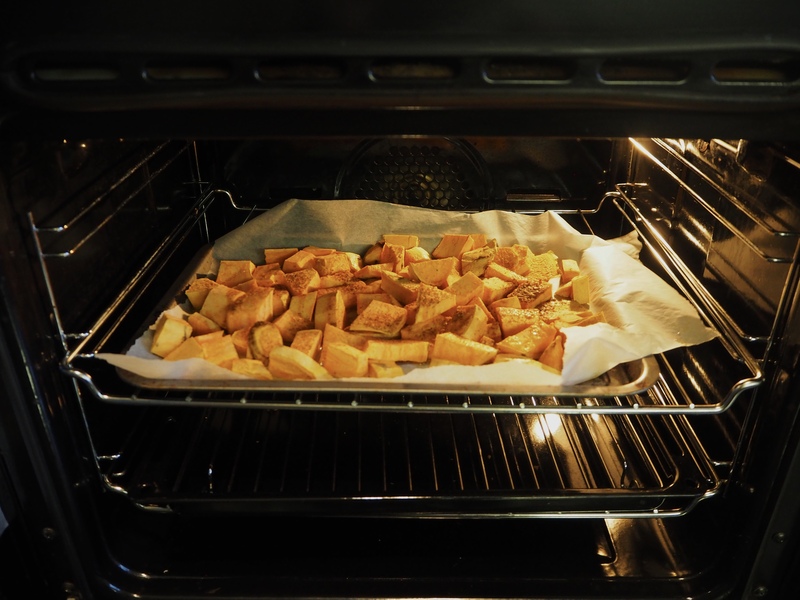 This was partly as I had done a test run the week before, where I realised that adding butter to the dukkah could help the crust get crispy, and that roasting the sweet potato for longer would give it a smokier, richer flavour. On the day, I served eight guests, but the recipe below is for four. Simply divide or multiply the ingredients if you’re serving more or fewer people! You can vary this recipe endlessly, by using different nuts, seeds, or spices – the below is simply my suggestion. The quantities in this recipe make enough to fill a 500ml airtight jar, so you can save it for future use. Heat a non-stick frying pan with no oil and add all the ingredients, roasting gently and stirring occasionally, on low to medium heat until fragrant (3-4 minutes). Remove and put in a blender. Pulse gently, as it should have a nice crunch to it and not be too powdery. Empty it into an airtight jar and keep aside (it’ll last for ages!). Pre-heat the oven to 175 degrees Celsius. 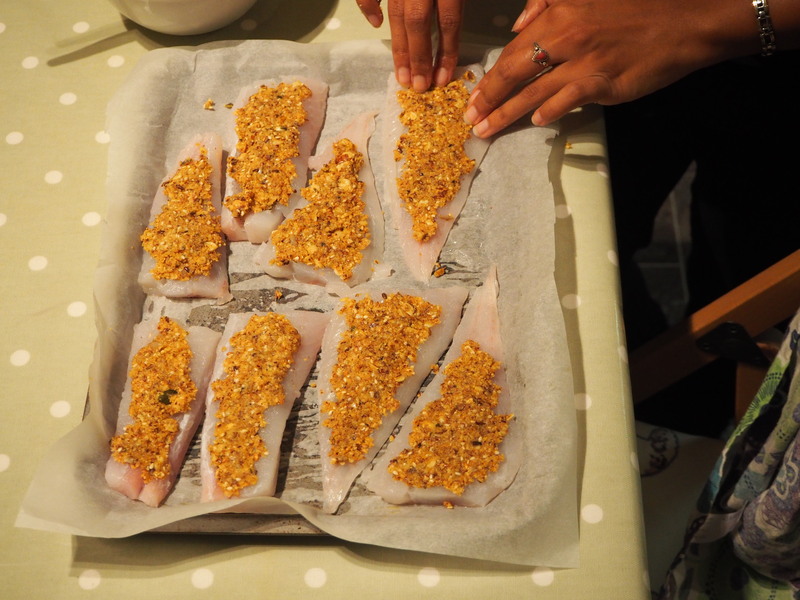 Line a baking tray with parchment and place the haddock fillets on it. 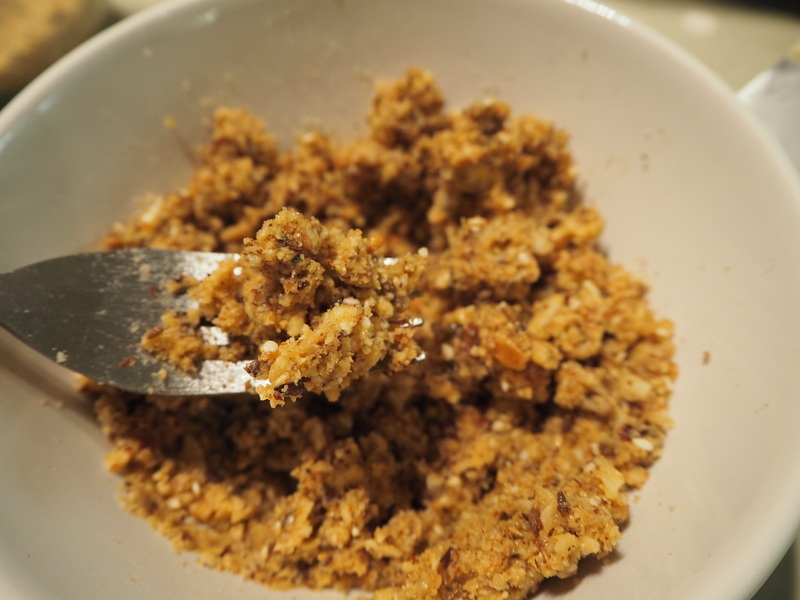 In a small bowl, combine the softened butter with the dukkah, pressing and mixing it together with a fork until there are no visible lumps. 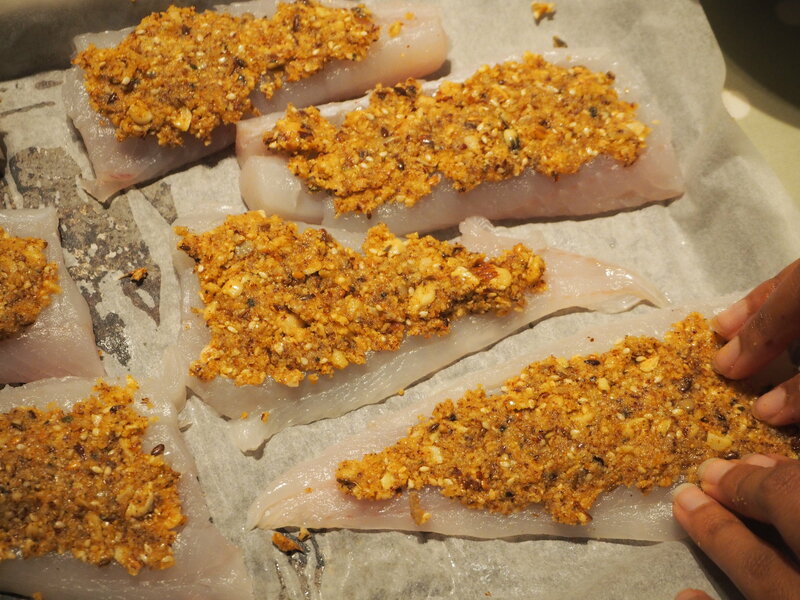 Spoon a bit of the dukkah mixture on each haddock fillet and press it gently into shape with your fingers. The mixture should be 2-3mm thick on top of the fish. Pre-heat the oven to 200 degrees Celsius. Peel and chop the sweet potato and lay out on a lined baking tray. Drizzle olive oil over the pieces, and add a generous amount of Creole salt. Roast for about an hour, mixing the pieces around every 20 minutes (don’t worry if some of the pieces turn brown, as that adds to the smoky flavour). Remove and either mash with a potato masher (which makes it more rustic), or puree in your blender (which makes it very smooth). As you’re doing so, add the cream and butter into the mixture. 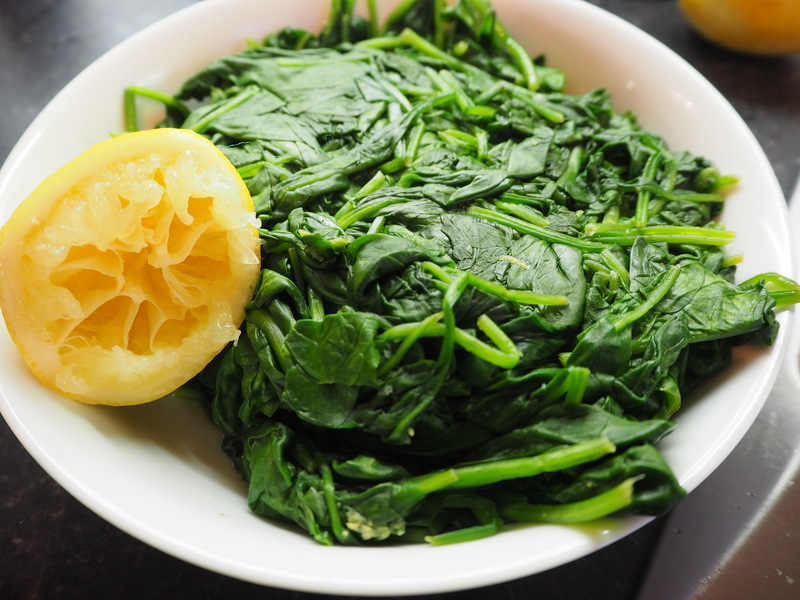 Salt to taste, and serve alongside the haddock and spinach! Read more about our Weekend of Food 2017 here.